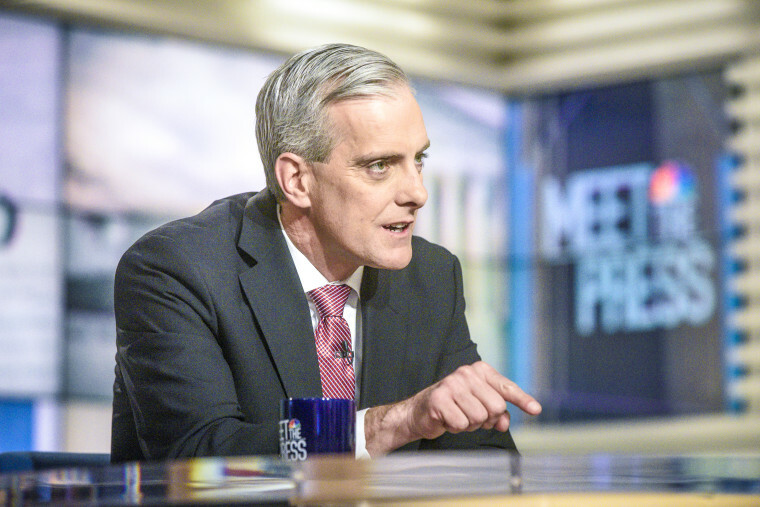 WASHINGTON — Former White House Chief of Staff Denis McDonough on Sunday said Senate Majority Leader Mitch McConnell “watered down” a warning about Russia’s attempts to interfere in the 2016 election and defended the Obama administration’s response to foreign meddling in the campaign. The language in a September 2016 letter from congressional leaders to state election officials was drastically softened at McConnell's urging, McDonough said in an exclusive interview Sunday on NBC's "Meet The Press." “The president asked the four leaders in a bipartisan meeting in the Oval Office to join him in asking the states to work with us on this question,” McDonough said. “It took over three weeks to get that statement worked out. It was dramatically watered down." The New York Times reported last year that McConnell had questioned the intelligence on election interference and agreed to a softer version of the letter that spoke of “malefactors” to be aware of but did not specifically mention Russia. McDonough, who served as White House chief of staff throughout the Obama administration's second term, alleged Sunday that they “continue to see to this day” the same lack of urgency from Republican leadership in Congress on the issue that they saw in 2016. The Obama administration has taken sustained criticism, including from President Donald Trump and even the top Democrat on the House Intelligence Committee, Rep. Adam Schiff, for not doing enough to prevent attempts by Russians to meddle in the election or for expressing enough urgency during the 2016 campaign. Since the 2016 election, Obama administration officials have repeatedly indicated that Obama did not raise more public alarm about concerns over Russian meddling because the administration didn’t want to appear as if they were politicizing the issue. Asked if there was a single thing the Obama administration would have done differently in hindsight, McDonough didn’t voice those kinds of regrets.